Kosttillskott för hästar och ponnyer. Hjälper till att minimera problemen med hepatisk överbelastning. 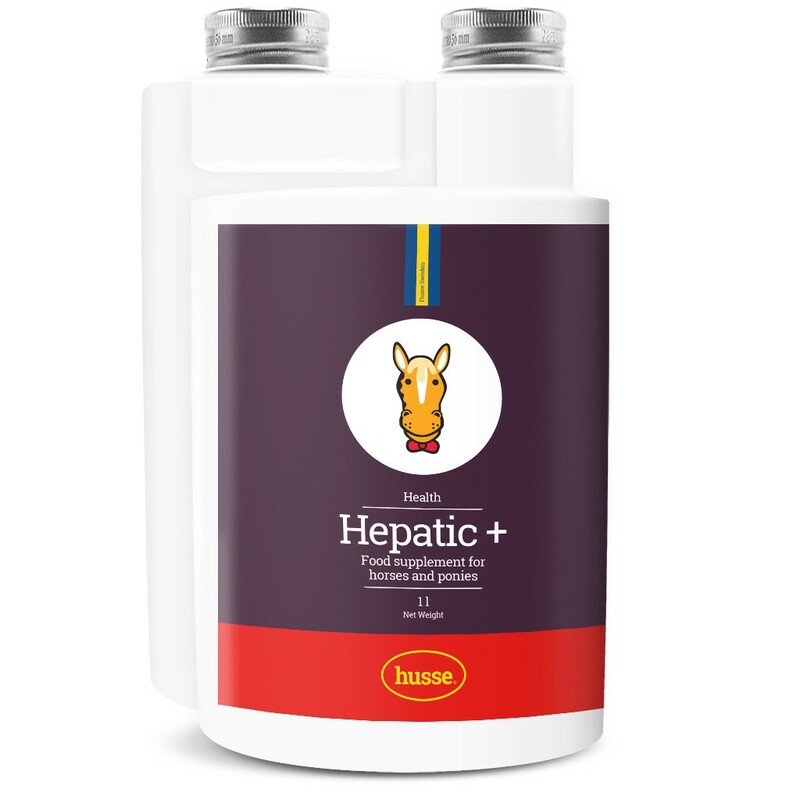 Hepatic + hjälper till att minimera problemen med en överbelastad lever. Levern omvandlar komplexa näringsämnen till enkla molekyler som celler kan absorbera, t.ex: socker till energi, proteiner till aminosyror. Levern renar blodet på avfall, varav en del upparbetas och vissa inte. Detta avfall lämnar kroppen på två sätt, som urin eller avföring. Det avfallsprodukter som lämnar kroppen via urinI har cirkulerat i blodet och fångats upp av njurarna, som därefter ser till att de lämnar kroppen via urinet. Avfallsprodukter som lämnar kroppen via avföring hamnar i tjocktarmen för att sedan tömmas ur kroppen. Upparbetning: Till exempel kommer hemoglobin avlägsnas från sin järnjon, vilken då kommer att lagras i mjälten. Bilirubin (gallapigment) kommer att vara ¾ återhämtade och modifieras av levern, för att bli pro-hemoglobin. Detta passerar genom mjälten, där den får en järnjon att bli hemoglobin. Many rival products have sorbitol, choline, methionine and betaine as their ingredients. The only ingredients in our product are ones with plant origins, but that does not mean they are less effective - in fact the opposite is true. Sorbitol, for example, contained in most products, stimulates the gallbladder and increases the speed of intestinal transit. As the horse does not have a gallbladder it is impossible to clear it out. Significantly increasing the speed of intestinal transit can cause diarrhoea possibly leading to owners losing confidence in our product. It can be replaced to good effect by plants such as milk thistle, black radish and artichoke. These plants have an effect on the increase in the volume of bile produced by the liver, which is not simply clearing out the gallbladder but a demand on the liver to produce more bile and so a more in-depth action, a more significant detox action. Moreover, these plants also combat jaundice, cirrhosis, and gall and kidney stones, just like betaine. Methionine and choline have an anti-fat effect (they prevent the fixing of fat in the liver); this action will be the same due to hops and milk thistle. Unlike the majority of products which only have a hepatic action, our product also takes account of the kidneys, which are also in permanent contact with toxins, and this is why we have added golden rod and asparagus, renowned for their diuretic (stimulate urine secretion) and purifying action on the kidneys. Our product does not merely drain the liver and kidney, it gives respect to the body, while avoiding any violent reactions to synthetic molecules. The liver is the only organ in the body that regenerates itself; plants work in symbiosis with it, facilitating an increase in its cellular renewal. It is advisable to carry out hepatic and renal draining after every worming, significant veterinary treatment, foaling, laminitis, etc. Horses, bigger ponies: 50 ml per day. Ponies and foals: 25 ml per day. Give the product during the period of 5 days. Repeat the treatment 3 to 4 times per year, especially after farrowing, change of food, too copious feeding and in case of important exterior interventions, de-worming, veterinary treatments and after every disease. Can be used during gestation, suckling and for young animals.